In an otherwise tragic tale of species loss and possible extinction, the recent sighting of a pangolin mother and her baby near Garonga Safari Camp in the Greater Makhalali Private Game Reserve is a triumphant moment worth sharing. The ground pangolin (Smutsia temminckii), also known as Temminck’s pangolin or the Cape pangolin, is one of four species of pangolins which can be found in Africa, and the only one that lives in Southern Africa. There are another four species found throughout Asia. 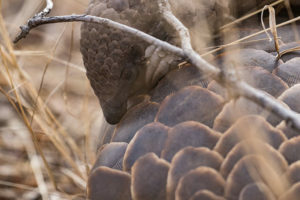 With shy personalities and a coat of brown scales, the elusive ground pangolin is well-camouflaged in the savannah woodlands it likes to call home. Unfortunately, this has not saved them from the international wildlife poaching and trafficking trade. Around 300 pangolins are poached every day, making these unusual animals the most illegally trafficked mammals in the world. 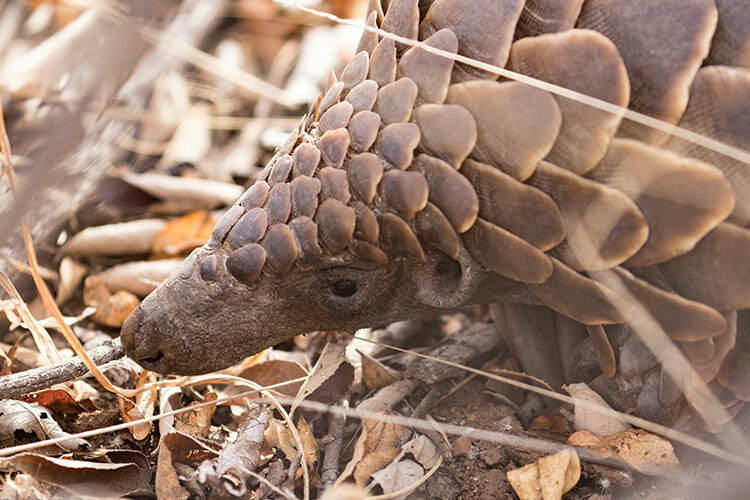 Despite this, the plight of the pangolin has only recently begun receiving the conservation attention and investment necessary to save this almost forgotten species. In comparison to the poaching of elephants and rhinos for their tusks and horns, the hunting of pangolins in Africa and Asia remains widely unknown, even though all species are listed as threatened with extinction on the International Union for Conservation of Nature’s (IUCN) Red List of Threatened Species. So when guides at Garonga Safari Camp, came across not just one but two pangolins whilst on a game drive with guests in the Greater Makhalali Private Game Reserve, there was palpable excitement in the air and many grinning faces. It was an incredible moment to witness and the mother carrying her youngster added a huge cute factor too. Fortunately, Garonga has a minimum of three resident pangolins in the area, so there is always a possibility to see them, if you have the patience and good eyesight. Read more about this exciting discovery from guide Sophie Barrett on the Garonga blog.